In this article you will learn about 2nd degree (second-degree) AV block. Before reading this article, make sure that you have read the introduction to atrioventricular (AV) blocks. Second-degree AV block implies that some atrial impulses are completely blocked, which means that not all P-waves are followed by QRS complexes. Second-degree AV block is subdivided into type 1 and type 2 (also called Mobitz type 1 and Mobitz type 2, respectively). Second-degree AV block Mobitz type I exhibits the Wenckebach phenomenon, which means that there are ECG signs of gradual exhaustion of impulse conduction. This manifests on the ECG as gradual increase of PR interval before a block occurs. Second-degree AV block Mobitz type II is characterized by sporadically occurring blocks, without any Wenckebach phenomenon. As mentioned above, second-degree AV block Mobitz type 1 is sometimes referred to as Wenckebach block. However, Wenckebach phenomenon may also occur in sinoatrial (SA) block which is why the term should not be used. Mobitz type 1 block is characterized by a gradual prolongation of the PR interval over a few heart cycles until an atrial impulse is completely blocked, which manifest on the ECG as a P-wave not followed by a QRS complex. This cycle repeats itself over and over again, such that every cycle ends with a blocked P-wave. Refer to Figure 1. The degree of block should be determined. It is denoted by counting the number of P-waves before each block. If every third P-wave is blocked, then there is 3-to-2 block (which is the most common). If every fourth P-wave is blocked, it is classified as 4-to-3 block, which is less common. 5-to-4 block is even more uncommon. Note that the higher the degree of block, the more difficult it may be to verify that the PR interval is being gradually prolonged. Indeed, in 2-to-1 block it may be impossible to observe and PR prolongation. Figure 1. Second-degree AV block Mobitz type 1, also known as Wenckebach block. Many clinicians find it difficult to differentiate between Mobitz type 1 and Mobitz type 2. A very simple rule of thumb can be applied to do this: whenever there are varying PR intervals, the diagnosis is Mobitz type 1 (Wenckebach block). The dysfunction in the AV node in Mobitz type 1 block can be viewed as a tendency to exhaust the conduction capacity. It starts with successful conduction of an atrial impulse (either with normal or abnormal PR interval). 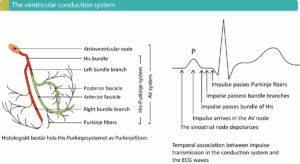 The AV node is dysfunctional, such that it will not be able to repolarize adequately by the time the next impulse arrives, which is why the conduction will be slower than the previous and the PR interval becomes prolonged. The AV node becomes more and more exhausted (i.e more and more refractory) each time until it is completely refractory and blocks the atrial impulse. This manifests on the ECG with gradual prolongation of the PR interval until a P-wave is blocked and thus not followed by a QRS complex. The AV node then recovers (after the complete block), only to repeat the cycle again. These cycles are often referred to as Wenckebach periods. Mobitz type I block may occur in younger healthy individuals (particularly during sleep). It is also common among athletes due to their high vagal tone. It is more common in older individuals. The prognosis is good, even in the elderly. Mobitz type 1 block generally does not progress to more advanced blocks. Should it progress to more advanced blocks, which typically is due to a more distal location of the block, an artificial pacemaker is needed. Management and treatment of AV block 1, 2 and 3 is discussed in a separate article. Mobitz type 2 block implies that some atrial impulses are blocked sporadically. The PR interval is constant (although it may be prolonged). Mobitz type 2 is more serious, because it is usually chronic and tends to progress to third-degree AV block. Moreover, cardiac output may be reduced if many impulses are blocked. Approximately 20% of patients have a block located in the bundle of His, and 80% have a block located in the bundle branches. Mobits type 2 block necessitates an artificial pacemaker. 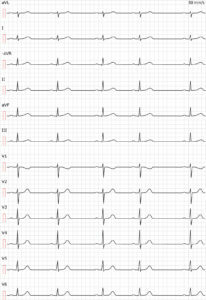 Refer to Figure 2 for ECG example. Figure 2. Second-degree AV-block Mobitz type 2. Both Mobitz type 1 block and type 2 block result in blocked atrial impulses (ECG shows P-waves not followed by QRS complexes). The hallmark of Mobitz type 1 block is the gradual prolongation of PR intervals before a block occurs. Mobitz type 2 block has constant PR intervals before blocks occur. Thus, if one can spot the gradual prolongation of PR intervals, Mobitz type 1 block should be diagnosed. If it is difficult to discern the prolongation, but there is still varying PR intervals, one should still diagnose Mobitz type 1 block. The PR interval is constant in Mobitz type 2 block. If the PR prolongation is minimal before a P-wave is blocked. If many impulses are blocked (2-to-1 block), because the PR prolongation becomes difficult to discern. Atropine or physical activity: these two increases heart rate which induces Wenckebach phenomenon in Mobitz type 1 block. Vagal stimulation: this causes increased block if the block is located in the AV node, which suggests Mobitz type 1 block. If the PR interval is prolonged, Mobitz type 1 block is more likely. If the QRS complexes are abnormal, Mobitz type 2 block is more likely.